A consultation for a more accurate diagnosis. The Centre du Cheveu uses the latest technologies to combat hair loss. Our unique concept is not a hairdressing salon where “miracle” products are sold but a real institution offering and using a range of 360o solutions. When you visit, we will determine the condition of your hair, as well as what has caused it to fall out. We perform a personalised assessment in order to offer you an effective solution, designed for your situation. You can talk to an expert in complete confidence who is used to treating every type of alopecia, early stages or very advanced. This specialist’s aim will be to follow and accompany you throughout your treatment. A personal file is created to ensure that your development is fully monitored. 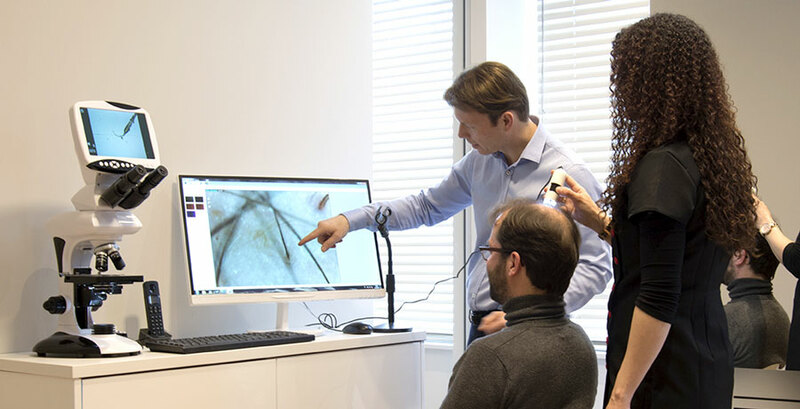 This personalised consultation can be followed by a camera examination which aims to quantify the loss, to estimate the life span of your current hair and to assess the chances of it growing back. Finally, the internet being full of hope but also full of traps, we inform you of all of the solutions currently available on the market.